The proud spire rises to 85 metres (278 ft), the highest in London. Kensington is a very prosperous part of London today. Sir George Gilbert Scott's church of 1868-72 mirrors that status. St Mary's first noticeable feature is the vaulted cloister that crosses the churchyard. This was added in 1889-93 by J. T. Micklethwaite and Somers Clarke. Scott's church is built of Kentish ragstone over brick, with blue Bath stone used to line it internally. The tower stands at the north-east corner of the chancel, an unusual position. The spire was added in 1879. The style of the church is 13th-century Geometrical, which Scott generally deployed, but rarely did he have the chance to build so lavish a church. The arcade in Early English style. The interior, 54.5 metres (179 ft) long, focuses on the high altar and reredos, which Scott designed and the firm of Clayton & Bell made. Clayton & Bell also provided most of the stained glass. An exception is the east window of the chapel of the Resurrection, which is by James Powell. The pulpit is a panelled and finely moulded Classical example that was given in 1697 by King William III, the builder of Kensington Palace. The grandest memorial (in the south transept) is ascribed to J. B. Guetfi and commemorates the seventh Earl of Warwick (died 1721). The Earl sits languidly in Roman dress and leans on an urn, against a large pedimented backplate surmounted by his arms. An earlier monument, to Wlliam Courten (died 1702), has distinguished connections, for it was carved by Grinling Gibbons for Sir Hans Sloane. 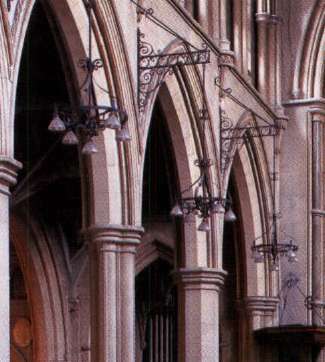 Scott's reredos, the focus of the interior.